Ever since the late 1800s, when Helena Blavatsky began the Theosophical Society, a burgeoning interest in the paranormal grew rapidly – first in Europe, then in the United States. The spiritual formation movement that has invaded the Protestant world, with its contemplative spirituality is a morphed development from Ignatius Loyola’s “spiritual exercises” of the sixteenth century. It is not unlike the elevation of self-awareness begun in the theosophical movements. This is an egregious invasion by Satan into Christian thinking. Fascinating! It has been easy to skip over that first issue of “spiritualism.” That has often been relegated to séances and appearances of deceased individuals. Though those will soon be significant issues, a broader, more sinister side to this is of vast importance to God’s people. Focused awareness of this “power” emerged in the 1920s and 1930s when a spiritualist, theosophist, astrologer, aggressive writer and Luciferian leader by the name of Alice Bailey came onto the world scene. She was a student of Blavatsky’s work. She also “received messages” from an alleged Tibetan monk, Djwhal Khul, which she shared in voluminous writings and lectures. Bailey’s influence grew quickly. She developed the Arcane School (a spiritualist training center) and the Lucifer Publishing Company (1922). The next year she changed the publishing company’s name to Lucis Publishing Company because of negative publicity. That publishing company became part of the Lucis Trust – which, in turn, became an NGO of the United Nations. Alice Bailey created a deep interest in occult “religious” thinking of the leaders within that organization. The Lucis Trust opened and still maintains the Meditation Room within the United Nations. Its empty stone altar, highly symbolic mural with an all-seeing eye and trapezoidal room portray numerous mystical beliefs and powers. Alice Bailey was “told” that mysteries of a coming savior would begin to be revealed after 1975. Then the world would start preparing for a world teacher – the Lord Maitreya. He held large audiences spellbound in a hypnotic trance – some say supernaturally. “This Maitreya will soon be known to everyone,” Crème said. “He will be a teacher for all of humanity. He will advise everyone politically, economically and socially. He will have extra-ordinary spiritual powers. Before Jesus opened up end-time issues in His Olivet discourse, He warned: “Take heed that no man deceive you. For many shall come in my name, saying, I am Christ; and shall deceive many” (Matthew 24:4-5). He further advised that in that prophetic period of time many “false prophets” would arise and deceive many (Matthew 24:11). “Then if any man shall say unto you, Lo, here is Christ, or there; believe it not. For there shall arise false Christs, and false prophets, and shall show great signs and wonders; insomuch that, if it were possible, they shall deceive the very elect. Behold, I have told you before. Wherefore if they shall say unto you, Behold, he is in the desert; go not forth: behold, he is in the secret chambers; believe it not” (Matthew 24:23-26). Why did Christ break into His sequenced apocalyptic message three times to warn of an end-time false Christ? Though such “messiahs” and “prophets” have appeared throughout history, this activity would be uniquely intensified and identifiable near the end. What might define that period? All false christs and signs would occur within one generation (Matthew 24:34; Luke 21:28, 31-32). Around that time Marilyn Ferguson began the Association of Humanistic Psychology and in 1975 began publishing the Brain/Mind Bulletin. In 1980 her first book hit the press: The Aquarian Conspiracy. She, too, promoted eastern mysticism and anticipated an age of world peace with the coming of a Maitreya. What generation was Jesus talking about when all of His prophetic events would actually occur together? Stunning! In 1978 a coalition of events regarding the calamities that Jesus noted in Matthew 24:7 began a “time of sorrows” (statistically affirmed). In 1978 Pope John Paul II was inaugurated (the head that “is” from Revelation 17). 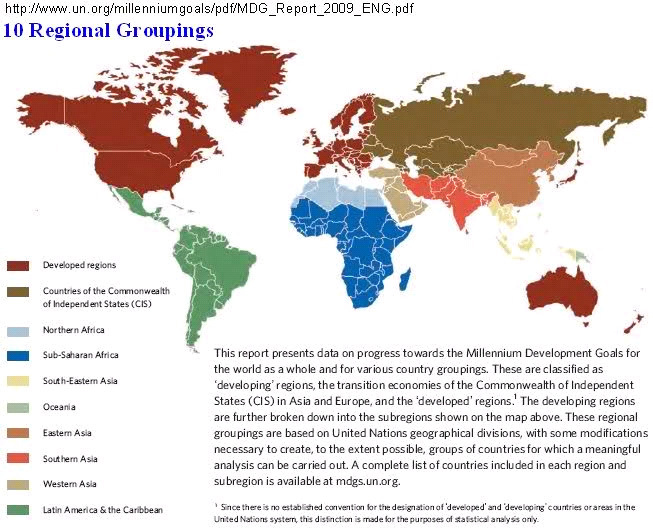 And in 1978 the United Nations began refining the ten world regions originally recommended by the State Department in 1942, then the Club of Rome in 1968 and, finally, in 2009 came the latest United Nations geopolitical map (which would parallel the ten horns in support of the beast – Revelation 17:12-13). “And the ten horns which thou sawest are ten kings, which have received no kingdom as yet; but receive power as kings one hour with the beast” (Revelation 17:12) (“one hour” = a brief time). In Revelation 13 the horns are crowned – they’ve received their kingdoms. “And the beast which I saw was like unto a leopard, and his feet were as the feet of a bear, and his mouth as the mouth of a lion: and the dragon gave him his power, and his seat, and great authority…. And they [the world] worshipped the dragon which gave power unto the beast: and they [the world] worshipped the beast, saying, Who is like unto the beast? who is able to make war with him?” (Revelation 13:2c, 4). Lucifer desires to be worshipped as God. This will occur soon. Paul warned: “And no marvel; for Satan himself is transformed into an angel of light” (II Corinthians 11:14). Satan’s protégé – the beast – will receive a similar homage. Christ and John’s warning flashes like lightning. Evidence mounts that we have objectively entered that “generational period.” Supernatural events are anticipated. “And when these things begin to come to pass, then look up, and lift up your heads; for your redemption draweth nigh…. So likewise ye, when ye see these things come to pass, know ye that the kingdom of God is nigh at hand. Verily I say unto you, This generation shall not pass away, till all be fulfilled.” (Luke 21:28, 31-32). “Beloved, believe not every spirit, but try the spirits whether they are of God: because many false prophets are gone out into the world.” (I John 4:1). As the end approaches (within a generational context – Matthew 24:34; cf. Luke 21:32), the risk of encountering false christs, false prophets and, finally, Satan, rises. These leaders lead astray (Matthew 24:5, 11, 25) any curious followers. This is similar to the wording describing the second beast of Revelation 13:13. Within the context of portraying those deceptive leaders, Jesus had two distinct blocks of advice: “Believe it not” (that Christ has come) (vs 23), “Believe it not” (that Christ is in the desert or secret chamber) (vs 26). Jesus, in strong language, warned us not to go out of our way to see those false christs – clearly, not even to satisfy curiosity. All mankind would be seen as sharing a divine within. The goal: Infiltrate and reform Christianity to elevate the interrelation of “self” or “soul” to prepare for the Lord Maitreya, who would “self-actualize” his followers. From 1863 to 1980 the Vatican invested a large amount of scholarly studies into astrophysics, several observatories and academic work in astronomy. In 1980 the Vatican Observatory Research Group joined the University of Arizona Steward Observatory in Tucson, Arizona. By 1987 the Roman Church had built an advanced technology telescopic center on Mt. Graham in southeastern Arizona with a special research facility. It was dedicated in 1993, having some of the world’s most advanced astronomical instruments (a binocular telescope and an infrared telescope called L.U.C.I.F.E.R.). Is Satan preparing the world for his coming? By all indications, terrible changes on planet earth are now setting the stage for a powerful being to “rescue humanity.” The antichrist, clearly located in the city of the “seven hills,” will soon emerge to coalesce the world under a moral banner. Then his dragon mentor will appear. “In the last days Satan will appear as an angel of light, with great power and heavenly glory, and claim to be the Lord of the whole earth. He will declare that the Sabbath has been changed from the seventh to the first day of the week; and as lord of the first day of the week he will present this spurious sabbath as a test of loyalty to him. Then will take place the final fulfillment of the Revelator’s prophecy. ‘And they worshipped the dragon which gave power unto the beast: and they worshipped the beast, saying, Who is like unto the beast? who is able to make war with him? And there was given unto him a mouth speaking great things and blasphemies; and power was given unto him to continue forty and two months.’ [Revelation 13:6-18, quoted. ]” Daniel 8 and 12 reveal that this period of time begins with the “abomination” related to a worship day. Evidence mounts that those claiming to be His people are prophetically unaware of much end-time light. The Great Controversy, p. 588. Cumbey, Constance; The Hidden Dangers of the Rainbow (Huntington House, Inc., Shreveport, LA ), p. 19. Spangler, David; Reflections on the Christ (Findhorn Press, 1978), pp. 44-45. Ferguson, Marilyn; The Aquarian Conspiracy (J. P. Tarcher, Inc., Los Angeles, CA), p. 48. The Signs of the Times, May 9, 1906. Patriarchs and Prophets, p. 210. Cumbey, Constance; op. cit., p. 86. Putnam, Cris and Thomas Horn; Exo-Vaticana (Defender; Crane, MO; 2013), p. 522. Ibid., pp. 546-547 (emphasis added). Manuscript Releases, vol. 19, p. 282. In Heavenly Places, p. 309. The Review and Herald, December 24, 1889.